Jyväskylä is a city and municipality in Finland and in the western part of the Finnish Lakeland. Start off your visit on the 14th (Sun): learn about all things military at Finnish Air Force Museum, see the interesting displays at The Alvar Aalto Museum, and then examine the collection at The Craft Museum of Finland. To find where to stay, maps, other places to visit, and tourist information, you can read our Jyvaskyla vacation builder app . Helsinki to Jyvaskyla is an approximately 3-hour car ride. You can also take a train; or fly. Expect a bit cooler evenings in Jyvaskyla when traveling from Helsinki in April, with lows around -3°C. 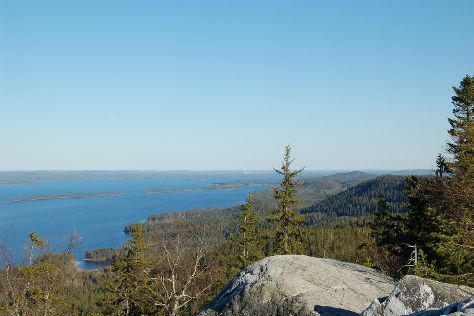 Wrap up your sightseeing on the 14th (Sun) to allow time to travel to Koli National Park. On the 15th (Mon), explore the activities along Pielinen, hike along Ukko-Koli Hill, and then explore the striking landscape of Kolinuuron kierros Nature Trail. To see ratings, reviews, photos, and tourist information, use the Koli National Park vacation maker app . Traveling by car from Jyvaskyla to Koli National Park takes 4 hours. April in Koli National Park sees daily highs of 6°C and lows of -2°C at night. Wrap up your sightseeing on the 15th (Mon) early enough to travel back home.